Dunkirk – What’s Going On? 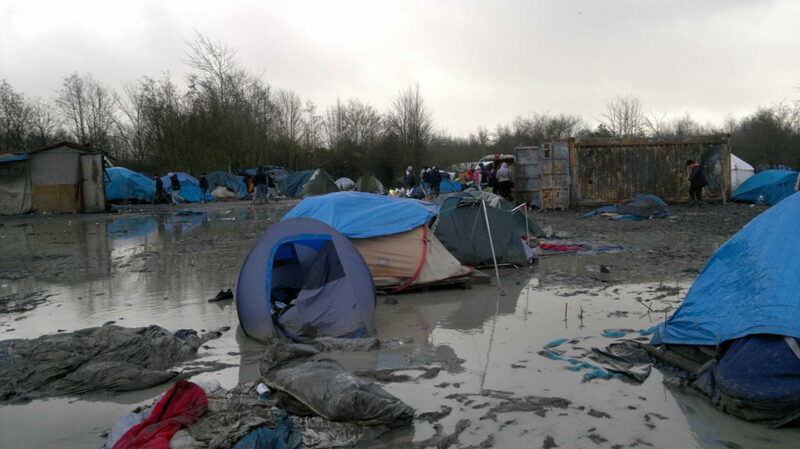 Last week I traveled to Dunkirk camp. I can confidently say it is one of the most wretched places I’ve ever visited. Populated by young Iraqi Kurdish men, women and children, the Mayor of the town has put a restriction on tents, wood and plastic entering the camp. As a result, living conditions are extreme. Last Monday 11th Jan, the Mayor lifted the restriction for one day only. 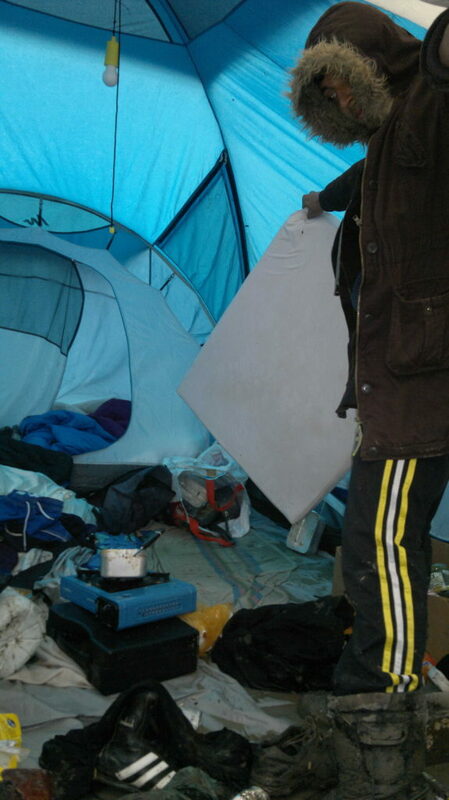 This was to allow materials into the camp. Volunteers turned up in droves with provisions. Others helped carry these into the camp. Reports from the ground were that French police were civilised and at times, helpful. The restriction is now back in force. In film below, long-term volunteer, Maddie, describes the state of affairs. The footage was shot by young Iraqi Kurdish men, residents of the camp, who volunteered for the task. We announced our intention to make a film to those gathered in the communal kitchen, drinking tea and getting warm. The boys ages ranged between eighteen and twenty-two. They were courteous and keen to help. We explained they could film whatever they wanted. They went straight to the tent where they all sleep. 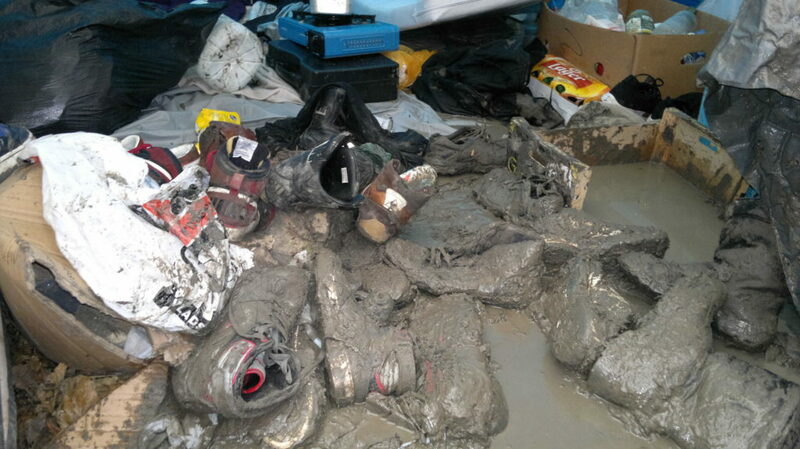 Signs of an ongoing battle against mud and water were evident. Their boots soiled black were stacked at the entrance. Strips of cardboard were used in an attempt to dam water encroaching on their bedding. Because of the restriction on wood, the boys are unable to raise the tent from the muddy swamp upon which it sits. One boy, Hama, excused himself from filming the rest of the camp so that he could return to the tent and scoop out water from inside it with a bucket. Footage was also shot by Saleh, one of the students we taught last September in Calais camp, The Jungle. Saleh is from Syria, fleeing Daesh / ISIS. He has been in The Jungle now for over three months. He was shocked by what he saw in Dunkirk – we all were. Thank you for taking the time to read this diary post.